NEW YORK -- Today it became official: the Oneonta Tigers will be relocating to Norwich, Conn., in time for the 2010 campaign. The announcement marks the latest chapter in what has been a tumultuous offseason in Norwich. 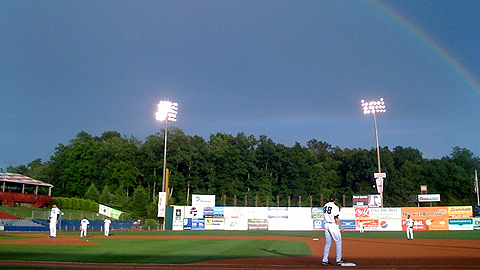 In September, the Eastern League's Connecticut Defenders announced they would be relocating to Richmond, Va., leaving a void in a well-regarded baseball market. Thanks to the New York-Penn League, a Class A Short Season circuit, that void has been filled. The announcement was made at a news conference on Thursday afternoon, less than two weeks after the Norwich City Council approved the NYPL's lease agreement for Dodd Stadium. The lease is good for a 10-year term with three five-year options and starts at $100,000 per year. "This was something that had been on the radar for about a year, but not something we were actively working on until late September," said New York-Penn League president Ben Hayes. "Norwich is a strong market with a high population density, with a stadium that offers great amenities. It will fit in well with the remainder of our league." Oneonta had fielded a New York-Penn League team since 1966. After the 2008 campaign, longtime owners Sam Nader and Sid Levine sold the team to a group headed by attorney E. Miles Prentice. Hayes stressed that the decision to re-locate one of the league's flagship franchises was largely due to current economic realities. "The league took the lead in negotiating the [Dodd Stadium] lease," said Hayes, who presides over a 14-team circuit that includes franchises in Brooklyn, Staten Island, Lowell (Mass.) and Burlington (Vt.). "There were three or four clubs that might have been interested [in re-locating], but Oneonta had the worst attendance, having drawn less than 40,000 last year. That, combined with the demographics of the county and the decline of the business environment, led me to present this opportunity to [the Tigers] first. "This wasn't an easy decision, for the club or for the league," continued Hayes. "Oneonta has hosted a New York-Penn League club for the past four decades, and the Nader family has deep roots when it comes to the history of the league. The annual championship trophy is named after Sam Nader's wife, and the Executive of the Year Award is named after him." When Nader and Levine sold the club in December of 2008, it was reported that the sale agreement stipulated that the team remain in Oneonta through the 2010 campaign. "There was no prohibition on re-locating, although there is a penalty that has to be paid, and that's something we took into consideration," remarked Hayes. But regardless of the deal's specifics, the club's front office now faces the daunting task of introducing the team to a new market in time for the New York-Penn League's Opening Day on June 18. Many key details remain to be determined, including what name the franchise will utilize in 2010 and beyond. Oneonta general manager Andrew Weber and assistant GM Eric Knighton are both making the move to Norwich. They will be joined by vice-president of operations CJ Knudsen, a respected league veteran who stepped down as general manager of the Vermont Lake Monsters in October. "We've got a lot of challenges ahead of us, but we welcome them," said Weber. "That's one of the reasons we have CJ Knudsen on board; he's going to be an invaluable resource as we make this transition." Through it all, the fledgling franchise will have one key goal in mind. "[The New York-Penn League] is one of the premier leagues in all of Minor League Baseball, and we want our organization to be one of the premier organizations in the league," said Weber. "That's what we're going to be working toward.